SBI Magnum Equity Fund: Is Its Focussed Strategy Paying Off? Home > Financial News. Simplified. > SBI Magnum Equity Fund: Is Its Focussed Strategy Paying Off? Launched nearly three decades ago, SBI Magnum Equity Fund is one of the few equity schemes that have survived multiple market cycles. Launched in 1991, by SBI Mutual Fund, it is one of the first schemes of the fund house. Mr Rama Iyer Srinivasan has been managing the scheme for nearly a decade. SBI Magnum Equity Fund maintains a predominant allocation to large-caps. Such a portfolio provides reasonable amount of stability and decent long-term returns. While some large-cap funds opt for a tactical allocation of 15%-20% in mid-caps to boost returns, SBI Magnum Equity Fund refrains from such an approach. Devoid of volatile and high-return potential mid-caps in the portfolio, the large-cap scheme maintains low levels of volatility. However, it does end up sacrificing on returns when the market is heading up. Its focused strategy allows the fund to take concentrated bets, however, if the weightage is misplaced, such a concentrated strategy can do more harm than good. This is one of the reasons the fund has lagged the benchmark in the recent past. Over the longer term of 3-year and 5-year periods, SBI Magnum Equity Fund has generated decent returns when compared to the benchmark. However, it trails behind several of its peers. In this brief analysis, we take a close look at the features and performance of SBI Magnum Equity Fund. 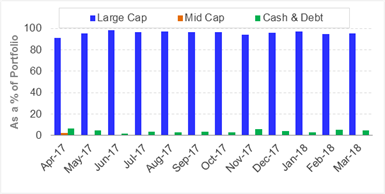 SBI Magnum Equity Fund has an investment objective to "provide the investor long term capital appreciation by investing in high growth companies along with the liquidity of an open-ended scheme through investments primarily in equities and the balance in debt and money market instruments"
Data as on March 31, 2018. SI Return as on April 11, 2018. Had you invested Rs 10,000 in SBI Magnum Equity Fund, five years back on April 11, 2013, it would have grown to Rs 20,770 as on April 11, 2018. This translates in to a compounded annualised growth rate of 15.73%. In comparison, a simultaneous investment of Rs 10,000 in its current benchmark – Nifty 50 - TRI would now be worth Rs 19,832 (a CAGR of 14.67%). Over the past five years, there has been a brief period of outperformance, as seen in the chart. 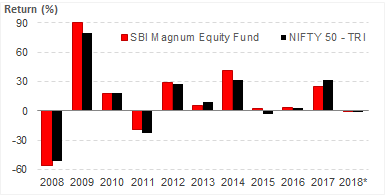 However, SBI Magnum Equity Fund has failed to maintain its lead over the benchmark. Hence, at the end of the 5-year period, the large-cap fund has generated an unattractive alpha. SBI Magnum Equity Fund has a track record of nearly three decades. The year-on-year performance of the fund vis-à-vis its current benchmark – Nifty 50 - TRI has been quite inconsistent. In certain periods, it has outperformed the benchmark by a good margin of 5-10 percentage points. However, in most other periods, the outperformance is limited to a few percentage points. The scheme has even lagged the benchmark in four of the past 10 calendar years. 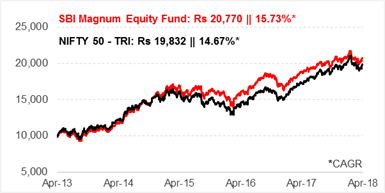 In 2016 and 2017 periods, when the market has rallied, SBI Magnum Equity Fund has lagged behind by a wide margin. It needs to be seen whether the risk-averse nature of the fund will pay-off over the next few years. The performance of SBI Magnum Equity Fund has been about average in the 3-year and 5-year periods. While it did manage to outperform the benchmark, it lagged behind several of its peers. All of the schemes listed in the table, maintained an exposure in excess of 80%-85% to large-caps over the past three years. A few schemes that kept a tactical allocation to mid-caps did better than others, albeit with a higher volatility. In the 1-year and 2-year rolling periods, the performance of SBI Magnum Equity Fund would have been a disappointment to its investors. The scheme not only trailed behind its peers, it lagged behind the benchmark as well. Clearly, the fund failed to capitalise on the recent market rally. In terms of risk, SBI Magnum Equity Fund does better than most schemes in the category. It has an extremely low volatility, given its overindulgence in large-caps. As it fell behind in terms of generating adequate returns, the risk-adjusted returns of the fund falls behind other peers. The top five large-cap funds based on the 3-year rolling period performance include—Motilal Oswal Focused 25 Fund, DSPBR Focus Fund, Reliance Top 200 Fund, Aditya Birla SL Frontline Equity Fund, and Aditya Birla SL Top 100 Fund. SBI Magnum Equity Fund positions itself as a focussed large cap fund. It has a robust investment process & follows a top-down approach for investment, starting with analysing the broader economic outlook, then identifying the sectors and eventually narrowing down to stock selection. The scheme maintains a concentrated portfolio by investing in 25-40 stocks. The fund focusses on stocks run by management with consistent performance in terms of growth & capital allocation. It also keeps an eye on valuations that are conducive with respect to its historical valuation and change in growth profile. SBI Magnum Equity Fund has maintained a steady allocation to large-caps over the year. The large-cap exposure has remained in excess of 90% throughout the year. The fund has rarely taken an exposure to mid-and small-cap stocks. If it did take an exposure to mid-sized companies, the allocation has remained under 5% of the portfolio. The cash levels too, have been maintained at under 5% of the overall portfolio. 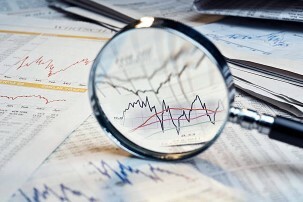 The fund manager adopts a buy and hold strategy and the portfolio is not churned very often. As SBI Magnum Equity Fund maintains a concentrated portfolio, the holdings are skewed to the top stocks. Out of the 26 stocks in the portfolio, the top 10 holdings account for 55% of the total assets. Among the list of stocks, HDFC Bank leads with an allocation of 10%. Reliance Industries follows behind with an allocation of 7%, while Infosys gains an allocation of 6%. ICICI Bank and Kotak Mahindra Bank trail with an exposure of 5.5%-6% each. Among the sectors, the holdings are skewed towards financial stocks (including banks), with a total exposure of nearly 40%. Banks alone, account for 27% of the holdings. Software stocks gains an exposure of 13%. 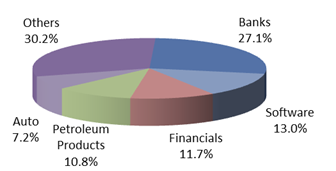 Energy and Auto sectors make it among the top 5 sectors with an allocation of 11% and 7.2% each. Being a large-cap focussed fund, it will be rare to find stocks in the portfolio that have delivered supernormal returns. However, a few stocks have generated a decent return over the past one year. HDFC Bank for example, the top holding in the portfolio, returned 31% over the past one year. Lower down the list is Reliance Industries, which returned 34% over the same period. Bajaj Finance, an NBFC, returned 51% in the 12-month period. At the same time, there were a few laggards in the portfolio as well. State Bank of India fell 15% in the 1-year period. Another PSU stock, Indian Oil Corporation, fell by 9%. A few other stocks, like ICICI Bank, Infosys and HCL Technologies delivered lacklustre returns of 10%-11%. Stable businesses, greater market share, quality of management and the sustainability prospects are factors that seem convincing to take exposure to large-caps at the current level. Large blue chip companies with strong balance sheets and proven track records could help ride the wave of short-term volatility to a certain extent. Therefore, diversified equity funds with a predominant large-cap allocation can offer stability to your investment portfolio. At the same time, funds that are restrictive in their investment approach or those funds that invest only in a concentrated portfolio of large-caps can be volatile and may fail to generate adequate returns over the long term. As markets are unpredictable, you need to invest cautiously without compromising on long-term growth. Large-cap funds are suitable for those who are looking for stable, market-beating returns over the long term. The capacity of the fund to deliver high returns at low risk becomes crucial. Only a handful of funds are able to deliver a superior risk-adjusted performance. Not all large cap funds are able to consistently outperform the benchmark across market cycles. Some large-caps take an opportunistic allocation to mid-caps and offer the perfect mix of stability and growth. But such aggressive funds may find it difficult to curb the downside risk. Therefore, it is pertinent to review large cap funds even on its ability to limit downside during falling markets. SBI Magnum Equity Fund is among those funds that prefer to keep risk low by avoiding an exposure to mid-caps. While the volatility remains low, the return potential of the fund takes a hit. This is a risk-return trade-off, which investors need to accept. The fund does maintain a focused strategy in order to enhance returns, however, the returns of SBI Magnum Equity Fund over the past few years does not seem very encouraging. Hence, you need to decide your priorities, in terms of risk or returns, before you invest in this fund. If you plan to invest in large-cap funds, do ensure that the investments is in line with your financial goals. If you are not sure about how to align these schemes with your tax planning or financial goals, do consult your financial planner or investment advisor. Note: This write up is for information purpose and not a recommendation to buy or sell the mutual fund scheme. As an investor, you need to pick the right fund to meet your financial goals. If you are not sure about your risk appetite, do consult your investment consultant/advisor. ‘Core and satellite’ investing is a time-tested strategic way to structure and/or restructure your investment portfolio. Your ‘core portfolio’ should consist of large-cap, multi-cap, and value style funds, while the ‘satellite portfolio’ should include funds from the mid-and-small cap category and opportunities style funds. But what matters the most is the art of astutely structuring the portfolio by assigning weightages to each category of mutual funds and the schemes you select for the portfolio. Moreover, with change in market outlook the allocation/weightage to each of the schemes, especially in the satellite portfolio, need to change. Keep in mind: Constructing a portfolio with a stable core of long-term investments and a periphery of more specialist or shorter-term holdings can help to deliver the benefits of asset allocation and offer the potential to outperform the market. The satellite portfolio provides the opportunity to support the core by taking active calls determined by extensive research. So, PersonalFN offers you a great opportunity, if you’re looking for “high investment gains at relatively moderate risk”. Based on the ‘core and satellite’ approach to investing, here’s PersonalFN’s latest exclusive report: The Strategic Funds Portfolio For 2025 (2018 Edition). In this report, PersonalFN will provide you with a readymade portfolio of its top equity mutual funds schemes for 2025 that have the ability to generate lucrative returns in the long run. PersonalFN’s “The Strategic Funds Portfolio for 2025” is geared to potentially multiply your wealth in the years to come. Subscribe now!